On-move from Melbourne, Australia to Anchorage, Alaska. Flying via Sydney and then Honolulu. Three hops. Three days. 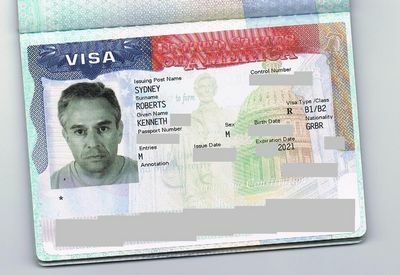 US B-2 non-immigrant visa. Done. Admittedly in my second passport. Back in Sydney. Safe with friends. Yet to work out how safely recover it. Nipping out of the airport when I change flights there a bit too risky. Awful lot of luggage. And at the mercy of unexpected delays. Could easily scupper the whole thing. And then there’s US Customs and Border Protection to contend with. Careful reading of their website suggests I need to complete a Declaration Form 6059B. And an I-94. But not a 94W. Remembering to retain the second portion of the 94 for entry into Canada. At least the visa exempts me from obtaining an ESTA authorisation. I think. And the rest should keep me occupied on the flight over. You’d never believe they actually have a Paperwork Reduction Act. Even with a visa valid for ten years, the permitted duration of stay is still determined by an immigration officer at port of entry. Default is three months, but the visa allows me to request more time. And I’ve supporting documentation to support my case. Note to self. Pack in carry-on luggage. Fingers crossed. Then there’s insurance. Medical cover needs to be upgraded to include North America. Bit of a hike in premiums. And must make sure I have at least third party liability when riding. Dull. But get it wrong and you risk bankruptcy. No joke. Finally, there’s all my kit. No soil allowed. Easy enough. Clean my tyres, boots, tent pegs and stove. But then there’s the prohibited items. Those the airlines don’t allow you to fly with. Matches, fuel and the like. Flammable products. Fortunate oil for Emma is inflammable. No idea about the difference. But got the data sheet to prove it. And then there’s the items you can’t bring into the US in any case. Agricultural products for starters. Probably going to loose my emergency rations. Chicken casserole. No meat products allowed. And questions about prescribed medicines in my first aid kit. E-mails sent. Clarification sought. But, either way, will declare everything on entry. Always the best policy. By the time I was called the ticket was crumpled. Slightly sweaty. Decided to rest it on top of my small pocket book. Into which I’d shoved various documents to support my case for a US visa. Letter of introduction from The Outward Bound Trust. Outlining my venture. Evidence of funds to support myself. Of ties to the UK. That’d I no intention of over-staying. Glanced once more at the number printed on the small slip. Three hundred and ninety. Must been the twentieth time I’d checked it. Sat in the waiting area of the US Consulate. High above Sydney. Fiftieth or so floor. People came and went. Called forward to the small interview booths. If there was an order to it, it wasn’t numerical. Curious about my fellow applicants. Sat about. Family with four daughters. Quite a few students. Overhearing snippets from the booths in front. Questioned mostly on their ability to support themselves. And a couple of nuns. One of whom bore an uncanny resemblance to Robbie Coltrane. Then my turn. A few questions. More of a pleasant chat than an interview. Explained the purpose of my visit. Why I sought a visa rather than use the usual Visa Waiver Programme. Added I had various documents in support of my application. But these weren’t necessary. Ten year multiple entry visa granted. Helpfully advised that the duration of each visit would depend on the immigration officer at point of entry. So wise to keep hold of the paperwork. Reflecting a short while later with my flask of tea, I felt rather buoyant. For one thing, I’d found the US Consulate very understanding. A few days earlier concerned Chilean ash clouds might preclude me from getting back in time from New Zealand for my interview. I’d explained the situation in an e-mail. Personal response within the hour. If was delayed, they’d be able to accommodate me. Just get in touch. And the morning’s experience had been similarly pleasant. I was really looking forward to visiting. Consular affairs from Ken Roberts on Vimeo. Ken heads for the US Consulate in Sydney, Australia. In search of a visa. The solitary policewoman. Still looking bored. I’d returned to the Public Security Bureau to collect my new visa. I hoped. After the protracted efforts to submit the application, I’d a suspicion it mightn’t be as easy as just walking in, handing over the receipt, and departing with another three weeks in my pocket. I was wrong. Quickly checking the visa was all in order, the obligatory signature, and I was off. Having thanked the officer profusely. She’d never know quite how overjoyed I was to be reunited with my passport. I’d become quite attached to it. Back outside, the obligatory taxi back into the city. And a driver I’d met previously. How could I be so sure? I’d recognise that dermatitis anywhere. Time for some more armchair adventure. Wrestling with officialdom, a less than useless guidebook, flurries of taxis, and an evasive stamp. Struggling to smile. Masking frustration an unenviable necessity. No matter how tempting it might be to do otherwise. Progress hadn’t been what I’d hoped for. I’d always known it would take the best part of two to three months to cross China, comparable to my journey through Europe. But a few bouts of illness now meant I was running out of time on my current visa. Not an unsurmountable problem. 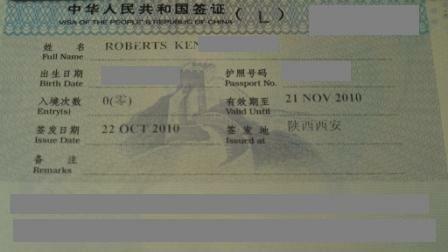 Entitled to apply for a further thirty day visa whilst still in China. Not as much as I’d like, but it would do for now. So, consulting my dubious guidebook, it was off to the local Police Public Security Bureau. I’d done my research. Photocopies of my passport. And my bank cards to show I could support myself without being a burden on the State. Couple of mug shots and a pen. What could be simpler? Quite a lot it seemed. For one thing, a friendly policewoman explained, yes, this was indeed the Bureau. But they no longer processed visa applications. Hadn’t done so for a while. That was now done at the Traffic Police Headquarters outside the city walls. Obvious really. So, helpfully provided with the correct address in Chinese, I headed off to find a taxi. First of many. Eventually finding the right building, found myself in a large hall, packed with passport photographers, photocopiers and long queues. Quite bewildering. It was going to be a long morning. Or it would have been, had someone not encouraged me to wander up to the next floor. The visa office for foreigners. Manned by a solitary policewoman. She looked bored. “Yes”, she said nodding, “You can apply for a new visa here”. Provided me with an application form. But my photocopies weren’t quite in order. Had to be A4. And I’d need a copy of my ’Aliens Registration Form’ from the hotel. Seemed reasonable enough, plenty of time to put everything in order and submit my request before they closed for the day. So, off I went. Another taxi. Back once more at the PSB, the mornings helpful policewoman had been replaced by a policeman. This time there was a problem. My registration form from the hotel needed an official stamp. Smiling with gritted teeth, I enquired as to when the Bureau would close for the day. “Perhaps four” he suggested, a little shrug of the shoulders. I doubted I could make it back in time. A day lost. But surely a problem easily fixed. Return first thing in the morning. The hotel did have a stamp. But it was in Shanghai. Which is nowhere near Xi’an. This was not going well. I enquired as to whether John Lei, the hotel manager I’d met on my first night, might have one. Stanley, the front desk manager, assured me he’d try and contact John, away until the next morning, and see what could be done. Fingers crossed. Resigned to a frustrating evening of waiting, of hoping. Then a phone call. From reception. Problem solved. With what looked like a very shiny new stamp. Back on track. Same solitary policewoman. Still looking bored. But very helpful. And impeccable English. All was now in order. Just had to pay about sixteen pounds for the visa. Another office. Return with the receipt and I’d be finished for the day. Took about ten minutes. Return in five days to collect my passport. Things were looking up at last…. [Author’s note: Despite the term ’visa extension’ being widely used, it’s a misnomer. What you actually get is a new visa – a zero entry one as you’re already in country – obtainable from the local (Police) Public Security Bureau (PSB). In theory, you could apply anywhere but, unless you’re a fairly competent Mandarin speaker, I’d recommend locations, such as Xi’an, where they’re used to dealing with foreigners. And where they speak English. Note that your thirty days starts from the date you submit your application, processing normally takes five working days, so once you get your passport back with the new visa, you’ve usually got just twenty three more days. Chinese inventions that changed the world? Gunpowder. And, of late, I’d add toilet paper. Originally the preserve of the ruling Dynasty, but now widely available. Which has proved to have been quite handy. Along with anti-diarrhoeals and antibiotics. I think you get the picture. Spot of bad luck I’m sure. And a bit suspicious as to the effectiveness of my locally acquired medications. But, stoic as ever about these things. No point dwelling on such matters. Besides, with consequential progress much slower than I’d expected, plenty to occupy to me. Reaching Hong Kong isn’t an issue per se. Given enough time anything is possible. And time is now an issue. Insufficient on my current visa, and, if I’m brutally realistic, my permitted thirty day extension is unlikely to be sufficient. China is a big country and the days are getting shorter. Calls for a more creative solution, just the sort of problem I relish. And I’ve already got a bit of an inkling as to how I might solve it. A cunning plan taking shape. Will make the sight of Hong Kong all the more satisfying…. It’d seemed prudent to look a little ahead, check the entry requirements for the Antipodean nations, and North America. First World. Didn’t think they’d be any issues. And, ordinarily, there wouldn’t be. And, with a bit of planning, there shouldn’t be. But it does reaffirm the need not to assume. And make sure you understand the often subtle distinction between having a visa, or a waiver in most cases, and actually satisfying the Immigration Officer on arrival that you’re not an economic migrant with aspirations to over-stay. New Zealand’s fine, no visa required, just need to make sure I arrive with tickets for onward travel, and have evidence to show I am able to support myself whilst there. Similar story for Australia, but my online application for a six month visa faltered a bit when required to list countries I’d visited, and there’s a limit of ten. So – if you’re counting – got stuck at the Azerbaijan border. I thought Canada a bit like New Zealand, with the addition of needing to show ties with the UK. Better find my driving licence. And have to show I’ll leave at the end of my visit. Hopeful a passport full of used visas will be convincing. I’ve been to the US quite a few times on their Visa Waiver Programme, but that limits me to three months for all of North America, which isn’t enough, and I’d need to show a ticket for onward travel. Which I won’t have. Not until deepest South America. So proper visa required. And whilst all the rules and regulations, the application forms, are rather more extensive than those for Central Asia, shades of the UK’s own onerous requirements, they are at least very explicit about it. Which I like. Might be making a few Consular calls in Hong Kong. Making sure I get a decent haircut first. Central Asia was almost over. Next China, the aim to reach Hong Kong and complete the crossing of another continent. Roughly six thousand kilometres – about four thousand miles. Up to ninety days to complete it on my new visa, planning on arriving late September. I’d my maps, the entire country on two sheets so not big on detail, but at least they showed place names in both Latin script and Mandarin characters. And the plan? Cross the border from Kazakhstan at Khorgas, three days ride from Almaty and a thousand kilometres or so west of the Chinese city of Urumqi. 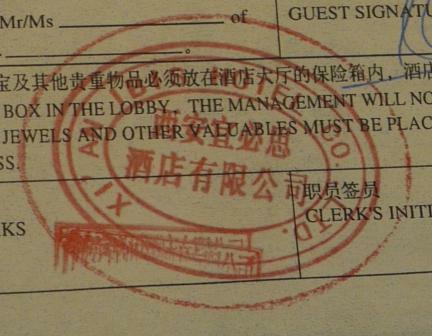 There’s some formalities to attend to on arrival, registering with the Police, which probably means a small detour to the city of Yining. And a chance to investigate the rumour that the internet may have been restored. An ATM would also be good. 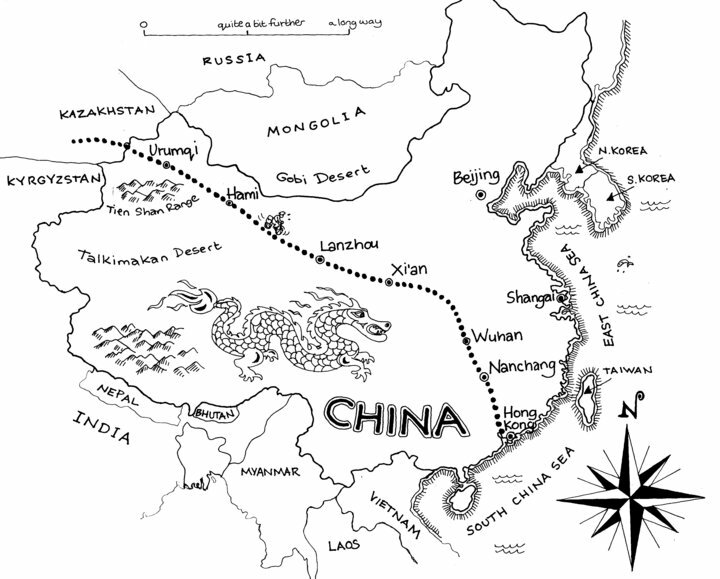 Then the push east along the Silk Roads, south of the Dzungarian Basin, Turfan Depression, across the lower reaches of the Gobi Desert, skirting around the Tibetan plateau towards Hong Kong. Hoping I’ll find an all-you-can-eat buffet or two.